Designed to create sounds hearing like classical ensembles: strings, brass, choirs and instruments as the guitar and the bass. But you can also use it for synthetic pads or unisson leads. It has 8 pairs of oscillators and each pair can be detuned, the output is stereo. For a powerful computer only : 8 notes = 128 oscillators (-P8, 25 to 45% of VST performance with a P4 3 ghz). Soundfont player. X SF2 is a soundfont player advanced and complete. Virtual synth. 2 lfo, 1 s&h, 2 filters: a 2p (LP, HP, LP, BR) and a 4p (LP). Vintage synthesizer. It is the more vintage of the X.Kalensky' series. The oscillators band-width is slightly limited and the KXMOD system can modulate the filter. Vintage synth. 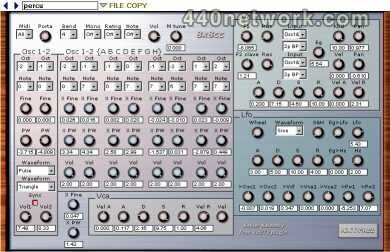 Same as KXPM2 synth. 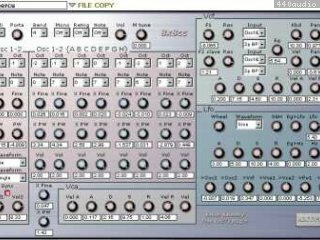 Osc3 can be a soundfont player and its oscillators are not limited in band-width, for a more actual sound. Vintage synth. Same as KXPM23. Each oscillator is completed by an envelope generator and a multi mode filter. It is the most complete of the series. Percu synth. 11 instruments: 1 wave player with 1 vco, 3 filters, 3 envelope generators and a complete control by the velocity. It has 5 stereo outputs.